This year, eight U of M undergrads spent ten weeks at the Minnesota Department of Transportation (MnDOT) as part of the Summer Transportation Internship Program. The program, in its third year, is offered in partnership by CTS and MnDOT. It is designed to provide students with the opportunity to gain professional experience and skills that will complement their academic pursuits. • Jonas Bauer (UMD) and Brandi Rajala (UMTC) worked in the Office of Environmental Stewardship. • Matthew Duff (UMTC) and Spencer Borchardt (UMTC) were placed in the Bridge Office. • Michael Quach (UMTC) and Justice Harvieux (UMTC) spent the summer in the Office of Materials and Road Research. • Samantha Bowman (UMD) worked in the Office of Project Management and Technical Support. • Lucas Kaari (UMD) was placed in the Office of Land Management. Below, this year’s participants share their thoughts on the program. 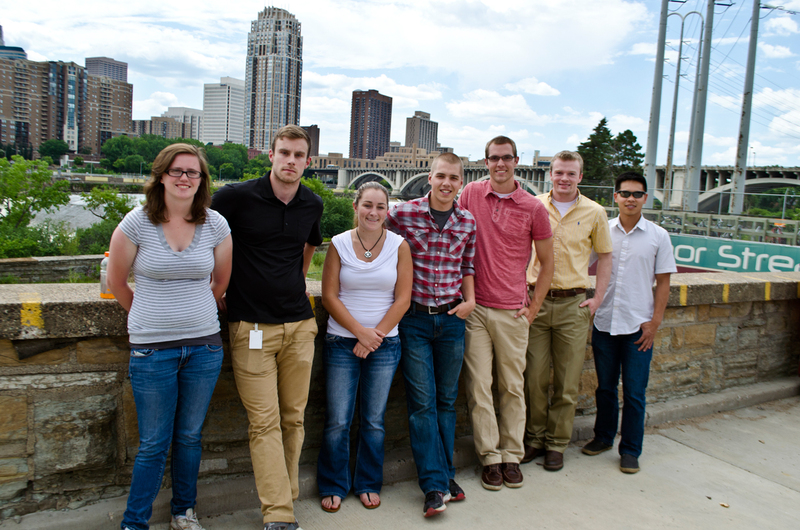 What did you enjoy most about your internship at MnDOT? Michael Quach: I was never bored at work. There was always something to do. I think this speaks greatly of my supervisor because she always had tasks for me to complete. I felt like I was trusted enough to get the work done with minimal management. This is a great feeling. Whenever I was in need of a change, I was sent out to pavement sites to do something new outdoors. This gave me the perfect break from computer work. Samantha Bowman: I interned in the Project Management Office in the Central Office building. What I enjoyed most was meeting new people. I met and worked with many consultants in my office as well as everyone else on our floor. I also went to many meetings where I was able to meet and talk with employees from different offices. I hope the relationships I created with everyone I met will help me when looking for jobs in the future. Justice Harvieux: The best part of my summer internship was all the real-world learning that I was exposed to. I had the chance to go to multiple projects working with paving concrete highways. Seeing various stages of these different paving jobs really helped me understand things that are needed to develop durable highways. Communication between contractors and MnDOT, quality checks of concrete mixes, and the staged timing needed for construction were only a few of the processes that I got to learn about. This experience showed me problems and solutions in practice that I could not get from a classroom. Matthew Duff: I got exposure to various types of projects handled by the bridge office. I was allowed to perform design checks on calculations for temporary walls and cofferdams submitted by consultants. This involved becoming familiar with some of the software programs that are used by MnDOT. A lot of what I did this summer helped me gain experience reading bridge plans and understanding what is being shown. Working in the standards and research unit, I also got exposure to some of the new technologies and design improvements that the bridge office is looking into using. Jonas Bauer: The thing I enjoyed most about my internship was the variety of work I was involved in. Basically every day was something different with a great variety between field work and office work. I also thoroughly enjoy the companionship between MnDOT workers, as everyone was extremely helpful and patient. Did you learn or experience anything that surprised you? Spencer Borchardt: I most definitely learned some unexpected things! I was very surprised by the skills needed to fully understand a bridge plan. The plans can sometimes be over 200 pages, and we never have to look at anything like them in school as students. Learning where to find the right information in a plan was a skill in and of itself! Also, I was very surprised by how many consultants MnDOT brings on to one job. It’s great that the work is shared among many companies, and it definitely brings a variety of experiences and specialties onto the project. Brandi Rajala: My boss was able to get me a tour with the main environmental person in charge of the St. Croix project. I was able to go out on the water and get a close up view of everything that the project was working on. I was able to see all the environmental issues surrounding this project as well as the amount of manpower and labor that is required to finish. It was a truly rewarding experience. Michael Quach: The level of detail that goes into government contracts is astounding. When I went out to pavement jobs, the senior engineers would explain the process to me while adding in the specifications that were required for the job. Every last detail was covered. There is so much more that goes into paving a road than I ever imagined. Justice Harvieux: The thing that surprised me most was how large and encompassing MnDOT is. I never thought MnDOT was responsible for so much in the industry. During my internship in the concrete standards unit, I witnessed other important aspects of MnDOT such as inspection, road maintenance, work-zone set up, research, right-of-way, and environmental protection, just to name a few. To the public, building highways and roads seems simple, but there really is a lot of work that goes into each project that the public doesn’t see. How will this internship contribute to your educational and professional goals? Jonas Bauer: This internship will greatly impact my career goals. I was never really certain about what environmental engineering would include, but through this internship I witnessed it firsthand. My great experience at MnDOT has made me seriously consider environmental engineering as a career field. Samantha Bowman: I learned a lot from my internship. One big thing I will take away is the communication aspect. I learned that good communication is everything. When working on building and setting up a scheduling system, you have many contributors, and good oral and written communication is important to keep everyone on the same page. Spencer Borchardt: This internship is crucial to my future goals. Employers value practical experience when hiring, and being able to hone my skills with MnDOT will definitely open doors in the future. Also, it’s great to get to know more civil engineers in the Minneapolis area. Despite the size of the metro area, the civil engineering community is quite well connected. I look forward to further networking with the engineers at MnDOT as I continue to work in the Minneapolis area. Matthew Duff: With this internship I was able to see how stuff I have learned in the class applies to real problems, and I got to use my classroom knowledge and expand on it. At first it would take me awhile to find something in the bridge plans because they can be extremely large, but after some time I became very quick at finding what I wanted. Having this exposure will be valuable for my career as I continue to look at plans and possibly work in a design unit in the future. I have always known that I wanted to be a structural engineer and working in the bridge office has further confirmed this. Prior to this internship I figured I would work with a consulting firm and had never put much thought into working for MnDOT. But now, I’ve seen that it is a great place to work. Brandi Rajala: This internship may not have been focused on engineering, but I was able to gain knowledge and experience related to environmental maintenance. Through this internship I was able to further determine what area of civil engineering I wish to focus on. This internship was one of the best experiences I have had while at the U of M.